NZ owners bought their Battery Electric Vehicle mainly because of its green credentials and lower running costs. The minority were motivated mainly by the BEV’s smart technology, or its quiet and comfortable ride, and a few primarily for the fast pickup. 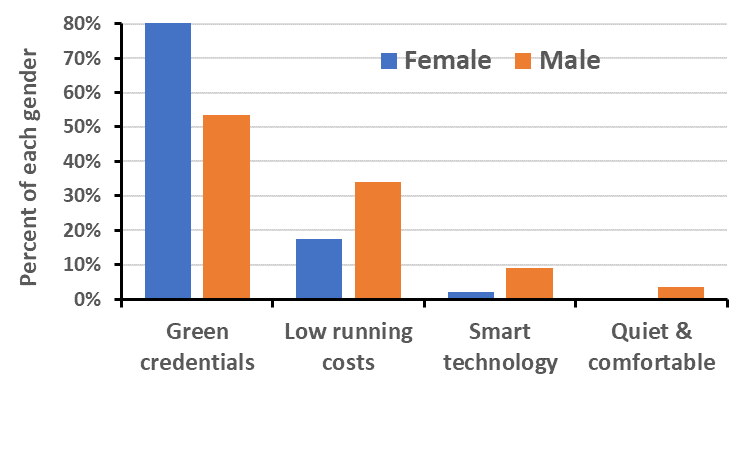 Women placed relatively more emphasis on green credentials, men more on low cost and smart technology. Older owners particularly appreciated the quiet and comfortable ride. Marketing messages may need to change to attract the ‘early majority’ of BEV purchasers rather than relying on what motivated this sample of early adopters to lead the charge. The poll was sent on 10 April 2018 to 683 electric vehicle owners who have enrolled in the Flip the Fleet project • 391 owners responded by 17 March 2018 • 225 respondents provided comments for their choice. The main reason nominated for buying electric vehicles was their green credentials (49%), followed by low running costs (33%). A small proportion of respondents were primarily attracted by their smart technology (7%), quiet and comfortable ride (4%) and fast pick up (1%). Many of the people who chose ‘other’ commented that there was a whole package of reasons for switching over to electric, so they could not single out one as being more important than the others. 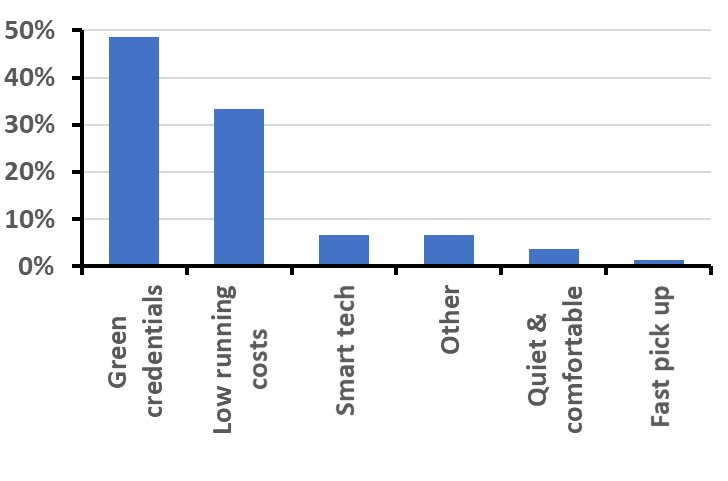 Respondents who commented on their reason for choosing electric vehicles were also invited to record their gender and age. Amongst those who commented and provided a gender, 165 (78%) were men, and 49 (22%) were women. A higher proportion of women (80%) chose to buy electric vehicles because of their green credentials than did men (53%; Fig. 2). Men were more likely (34%) to buy an electric vehicle because of their lower running costs than women (17%), and more likely (9%) to choose EVs because of their smart technology than were women (2%). Fig.1 The main reasons that men and women bought their electric vehicles. This figure excludes those respondents that chose ‘other’. Age had little effect on the reasons people chose an EV, though those respondents who identified quiet and comfortable ride as their main reason average about 10 years older than those choosing other reasons. Once again, respondents in Flip the Fleet’s monthly poll have proven they are a dynamic, future-oriented lot who should be in charge – no pun intended – of planetary concerns. Here we highlight a few of the more colourful quotes, but the section at the end lets rip with a fuller record of your wonderful responses. Nearly half the respondents, at 49%, cite the green credentials as their primary reason for buying an EV. For some, the purchase was fuelled by concerns for their immediate environment, to be assured their kids could ride to school in clean air; for others, it was a global concern. “I did it for the good of the planet,” was a common theme. Both are equally valid, since you can’t have one without the other. Many comments included that it “felt good” or “made them smile” to own an EV – a clear sense of empowerment in the individual making a difference in the face of serious concerns. How serious? Deadly serious for some. “The future of individual transportation needs to be sustainable and that would not happen without vigorous technology improvements. Also, without the challenge being put, and attempted to be met, we have no future,” said one, pulling no punches in regard to human survival. Another cited Donald Trump: “When he was elected, initial despair led to a realisation that we can’t rely on politicians to sort out our environmental issues and it’s up to us.” Buying an electric vehicle is a good step in that direction. As many respondents of Flip the Fleet have commented, buying an EV is a decisive step in a bigger journey of carbon-reducing practices such as installing solar energy and reducing air miles. It’s getting started that counts; the rest follows naturally – especially as people realise that, in some respects, saving the planet saves money. For more examples of savings, see “Doing the Sums” below in the Comments section. As a developing technology, EVs inevitably still have a way to go in battery technology. It seems that the Flip the Fleet forum is a useful place for owners to air some grumbles. “Had we been unable to get an electric vehicle that could do my commute (120km), we would have gone for a hybrid to at least cut emissions. However, my car is really, really struggling with the cold weather and will not make it home without an extra charge before heading home – not at all what I was told it would be able to do,” bemoaned one owner. The adoption of EV technology by big players such as Air New Zealand and the New Zealand Government is an important endorsement that New Zealand is well on the road to widespread EV ownership. This reason was more common amongst older people. An elderly, hearing-impaired couple appreciated the quiet-running of the car, because they can now enjoy a nice chat while driving. How cool is that? Just five people or one percent highlighted the fast pick up/acceleration as the prime reason for buying, but if EVs had extremely slow pick-up, it could possibly be a deterrent. There is plenty to think about in your scores and comments. Firstly, the results of this month’s survey backed up some of the assertions made in last month’s one about gender (http://flipthefleet.org/2018/1-click-survey-17/). There is statistically significant evidence here that women are more likely to switch for environmental reasons and men are more attracted to the tech and cost savings (Fig. 2). So although women are equally likely to buy an EV as men, they do so for different reasons. We should target our EV marketing messages accordingly. One respondent perceptively pointed out that the immediate reason for purchasing an EV is different from a reason for switching: She/he said: “Reason (environmental benefits) is distinct from trigger. I did it now because the technology became sufficiently capable and affordable”. Others pointed out that they finally bought because their old car died or was starting to cost too much. We have met many people who stated that their next car would be an EV but in the meantime there was life left in their old ICE vehicle, or that they wanted to wait until the range or affordability improved – see 1-click survey #11 for details of this strategy http://flipthefleet.org/2017/when-should-people-buy-first-ev/. Your testimony and the quantification of the benefits that you provide in your monthly uploads provide assurance and confidence to prospective buyers, but as one of you pointed out, it’s the beliefs of the ones following on that count most if we are to accelerate EV uptake: “We really need someone to do the same survey amongst people that are on the brink of switching, or hardly have thought about switching. Last month’s survey about the gender issues was interesting, but really, we need to forget about the petrol heads – figure out what those in a more open frame of mind think and aim the messages at them.” We agree, because as uptake diffuses more into the general population, their reasons for buying (or more importantly, not buying) will be different from you lot that have taken the plunge. There is a lot of research about what affects uptake of new ideas and technologies. An important early model was suggested by Everett Rogers. He recognised several groups of potential adopters (Fig. 3) in which you BEV owners will be considered innovators and experimenters, or early adopters. The next challenge is to get the “early majority” into electric vehicles. If you redraw Rogers’ graph as an uptake curve, it comes out something like Fig. 4. 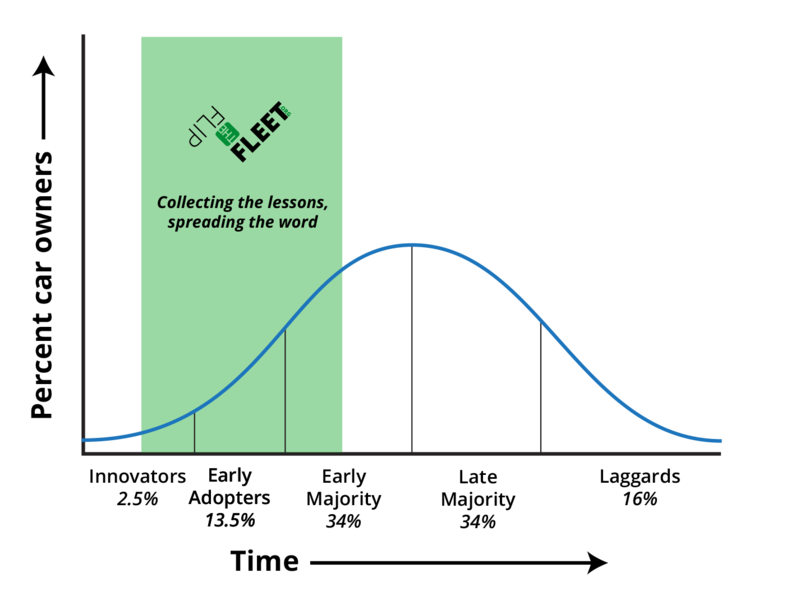 Your help to Flip the Fleet is all about shifting the curves to bring about earlier capture of the benefits and solutions to the urgent environmental problems that many of you have reported here. The main lesson here is that the reasons and relative importance of the motivations will change as we go from left to right in Figure 4. So our messages as a movement might have to change as we bring more people into our club. As the previously mentioned respondent said – maybe we shouldn’t waste breath on the petrol heads (they’ll be laggards in Rogers’ model) and get on with crafting the key messages for the “early majority”. Figure 3. E.M. Roger’s “Diffusion of Innovations” model. Figure 4. The model in Figure 3 has been turned into an uptake curve. 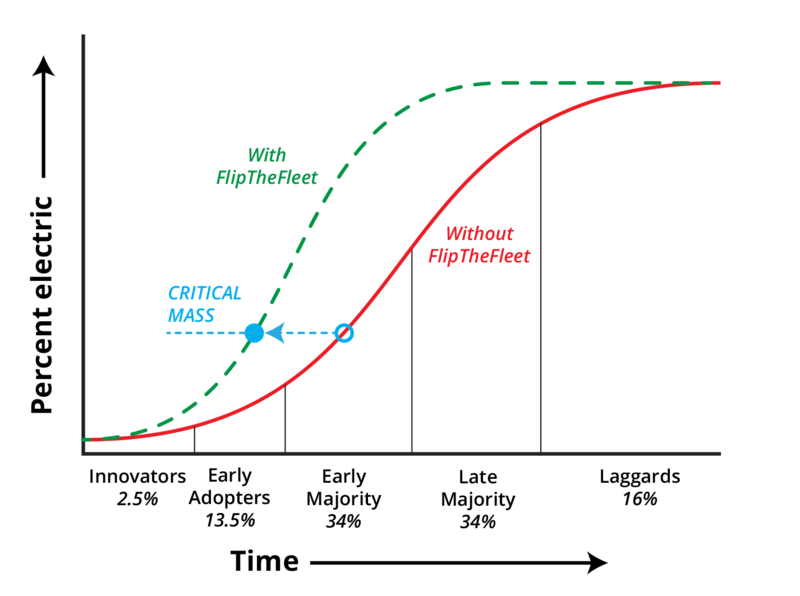 With your help we hope to bring the curve forward, to be steeper, and reach a “critical mass” earlier when the uptake has its own momentum without help from the EV community. Many of you expressed multiple reasons for buying EVs, and that some of the reasons for appreciating the vehicles emerge later (see http://flipthefleet.org/2018/1-click-survey-16/). This is a clear warning, that we have stressed in earlier reports, to not single out just one reason in our communications and advocacy campaigns. It was also obvious that even though people differed in their main reason for taking up EVs, they felt their own reason very keenly indeed. So, whatever your own passion, please don’t think it’s the only reason for buying an BEV and please be careful to not diss other peoples’ beliefs and thinking – we are all in this together. Whatever your reason for not having a tailpipe, we are all avoiding sending kilograms of GHGs into the atmosphere. Below is a lightly edited and re-arranged selection of many of the comments received. We have arranged the topics in order of overall importance signalled by the scores (Fig.1) except that the ‘Other category’ appears at the end. “Donald Trump. But seriously, I’ve wanted to be more green but still be mobile for many years. When he was elected, initial despair led to a realisation that we can’t rely on politicians to sort out our environmental issues and it’s up to us” ● “Because I am so extremely concerned that governments and corporations are doing nothing about climate change, environmental degradation, etc”. We don’t have a planet B. Combat climate change – now! “The 6-star safety rating of the Leaf – we were expecting our first child at the time of purchase, and couldn’t find a safer car. Life’s too short, just have some fun! This month’s survey topic was suggested by Kathryn Fitzpatrick from EECA’s communications team. Please suggest questions to ask of your fellow EV owners in future 1-click surveys – email your requests to wecan@flipthefleet.com. From Flip the Fleet, thank you to all EV owners for your scores and comments. Your participation directly contributes to our work in encouraging more EVs on our roads – and taking the ‘car’ from carbon emissions. To help save the world. And I hate big oil. And I new it would be cheaper than gas. Tired of breathing dirty air in the cities. Our biosphere is filing with pollution.